When the Lincoln & Continental Owners Club asked me to road test a 1995 Lincoln Mark VIII and compare it to my 1956 Continental Mark II, I panicked. I had never done a published road test before. I looked at some of the recent tests in the car buff magazines and they were frightening. They were done with lots of instrumentation, reporting things like lateral acceleration in G-force units, slalom speed, rates of deceleration, etc. Plus there were always letters to the editor disputing the results - "In your test of the Clamshell 3.2-litre Deluxe, you claim a top speed of 113.4 miles per hour. My buddy is an Indiana State Trooper and we borrowed his radar gun over the weekend and clocked my Clamshell coupe at 119.8 mph. Furthermore, your front track measurements are incorrect ..."
You get the picture - lots of nit-picking. And I'd be exposing myself to the greatest group of nit-pickers of all - LCOC members, who will spend hours over a few beers discussing how many Mark IIs were really made and what's the correct color of the windshield fluid reservoir cap on the '77 Town Car. Then I discovered a role model - Tom McCahill. McCahill tested cars for Mechanix Illustrated from the late Forties to the early Seventies. Everybody called him Uncle Tom probably because he was the kind of uncle everybody wished for. He was a no-nonsense guy who loved cars, dogs, driving fast and a couple of scotches at the end of the day. He palled around with notables, including bandleader Paul Whiteman. Unk tested cars using nothing but a stopwatch, a heavy right foot and the seat of his pants. His prose was legendary; he compared the handling of a '57 Buick to "a fat matron trying to get out of a slippery bathtub." The swivel seats on the '59 Imperial were "as easy to get into as a floating crap game." My friend Marty Hayes and I once brought a copy of Mechanix Illustrated to high school when asked by our English teacher to cite examples of modern, enduring prose. The teacher was not amused by Uncle Tom's writing. McCahill spoke bluntly, too - his opinions were firm and, if you didn't agree - too bad. 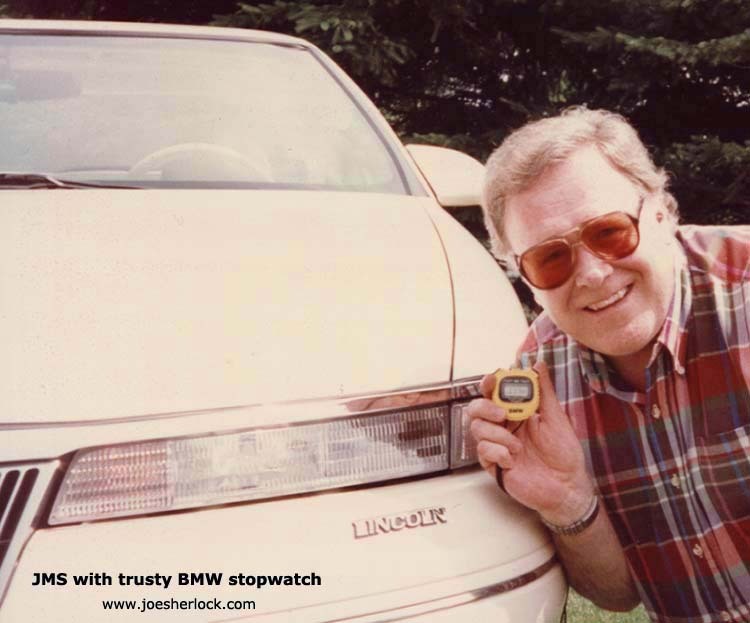 So ... armed with nothing but a heavy foot, an attitude and a digital stopwatch which I got in 1988 from a BMW dealer as a premium for test driving a new 7-series (I liked the stopwatch better than the car), I headed to Detroit to wring out the 1995 Lincoln Mark VIII. When I picked the car up my first impression was that this was indeed a personal luxury car. I felt surrounded by instruments; the dash and console seemed to wrap around me and everything was in easy reach. As I moved off into traffic, the car felt, well, agile. You point it; you punch the gas pedal; it goes. This was not a car that would take some getting used to. I felt at home immediately. I hadn't been to Detroit in ten years and I had forgotten how much the streets get beat-up from those cold winters. Asphalt doesn't like big temperature changes. It gets brittle when it's cold and it doesn't like to be hammered by cars and trucks with chains and studded tires. 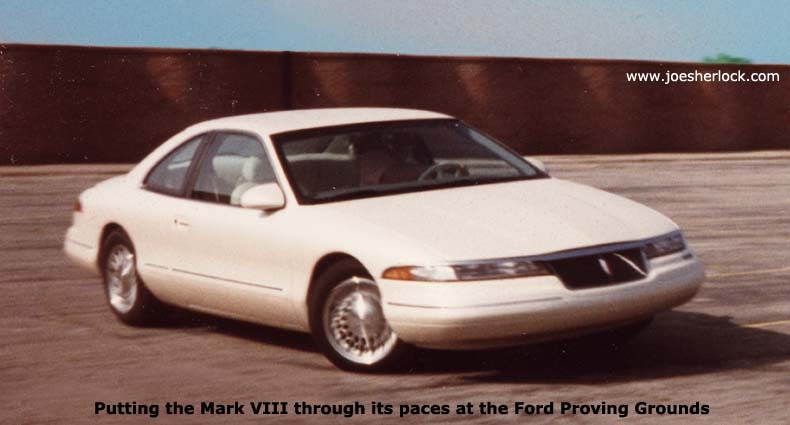 Choppy, potholed roads didn't bother the Lincoln Mark VIII. That air suspension just smoothed out everything. The computer controlled suspension just soaks up the bumps and potholes but when you throw the car into a corner, the computer instantly responds and stiffens everything up so that the Mark doesn't wallow and thrash around. Tom McCahill would have said that the VIII was as "smooth as a vanilla ice cream soda that's been standing in the sun." By comparison, step into a Continental Mark II and the controls are generally within easy reach although the heater and air conditioner controls are set low enough that you've got to take your eyes off the road to make adjustments. The Mark II rides well but wallows in the corners - big time. You shouldn't try any tricky cornering in a Mark II anyway; you'll just lose those expensive heavy turbine-styled wheel covers when they go flying off the wheel. Replacements are over $200 a pop - if you can find them. Uncle Tom would probably tell you that they're "as rare as ladies of the evening in the church choir." The Lincoln Mark VIII is an exceptionally quiet car, too. When you punch the gas, you'll hear a nice but muffled V-8 rumble as the car takes off. When you're at cruising speed there's a real absence of noise. Tom would say that this Lincoln is "as quiet as a pocketful of Jello." If you need some sound, crank up the JBL audio system. It's great and creates the same theater of sound effect as the Bose system found in competitive contemporary cars. The Mark II is a pretty quiet car for a '50s hardtop but the vent windows and lack of door pillars make it hard to prevent wind noise at freeway speeds. Turn on the Mark II's Town and Country radio and all you'll get is AM - after the vacuum tubes warm up. The 6-way power adjust seats in the Mark II are very comfortable for me; we've taken lots of long trips in ours and the seats feel as good after eight hours as they did when I first got in. The Mark VIII has about-37-way power adjusting seats. I certainly liked them and I think that they can be adjusted to fit just about any driver. We didn't take the Mark VIII on any long trips but, if we did, I bet they'd still feel great 10 hours after we started. Mr. McCahill would have likened the VIII's seating comfort to "a wheelchair upholstered in cream puffs." What about performance? Well, the Lincoln Mark VIII is a real Hot Rod Lincoln. The engine spools up quickly and you can easily burn rubber from a standing start if you don't engage the traction control switch. I clocked 0 to 60 in 7 seconds flat; Motor Trend says 7.2 seconds. On a quiet evening on the Southfield Freeway, I boosted our Mark VIII tester up over 100 mph; it got there quickly and felt great. MT says this puppy will do the quarter mile in 15.4 seconds with a trap speed of 95 miles per hour. I have no reason to disbelieve them. What about the Mark II? Well, Motor Life magazine tested one in 1956 and said it would get to 60 in 11.5 seconds. Sounds about right to me. My Mark II does about 12 seconds if you start it in low and manually shift although the 40 year-old powertrain never sounds happy when it's pushed. In contrast, the Lincoln Mark VIII sounds very happy when you push it. It's a little unfair to compare the Mark VIII and Mark II directly. The Mark II is a much heavier car. And it has less horsepower. 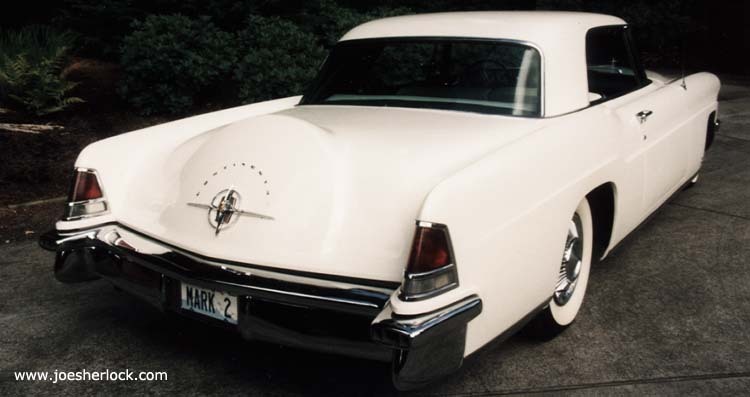 When the Mark II was new, FoMoCo declined to list its horsepower but everybody knew that the Mark II had the '56 Lincoln engine which was rated at 285 hp. SAE changed the way they rated engines beginning with the 1971 models. So, by today's measurements, the Continental Mark II probably has 200 or so horses. That's no match for the 280 ponies under the hood of the lighter Lincoln Mark VIII. Performance is, of course, a relative thing. A 1956 Volkswagen would get to 60 in about 30 seconds. A '56 Corvette would get there in about 7 seconds. The Mark II was in-between but nearer to the Corvette than the VW. Today, the performance gap has narrowed a lot. A 1995 Volkswagen Golf will get to 60 mph in under 10 seconds; a new Corvette LT-1 in just under 6 seconds. At 7 seconds, the Mark VIII is still nearer to the Corvette than the VW. Unk would have probably said that the '95 Mark is "as hot as the mustache of a cross-eyed fire eater." Do I have any complaints about the Mark VIII? Well, when I first drove one in late 1992, the interior looked too stark. They've since added some rosewood trim to warm things up a little but it still seems a little too clinical to me. The interior of the modern Lincoln Mark VIII doesn't compare to the luxurious hand-finishing of the Continental Mark II. And then there's all that interior chrome detailing. By contrast, the Mark II's interior speaks volumes about luxury. The exterior of the Mark II was considered conservatively styled and relatively chromeless when it was first introduced but it's got a lot more chrome than the Mark VIII does. I do like the optional chrome wheels on the VIII, they add a distinctive touch to the exterior. A couple of extra pounds of chrome in the bumper areas and a set of whitewalls would make the Lincoln Mark VIII just about perfect in my book. The VIII's price is very competitive with other contemporary luxury coupes and, in 1995 dollars, it's about 33% less pricey than the Mark II. Oh ... my other complaint about the Lincoln Mark VIII was that I had to give the car back to Ford. Until I realized that I had to return it I was, as Tom McCahill surely would have said, "as happy as a pack of fleas at a dog convention!"